In 1524, Thomas Wolsey, who had served as a Canon at St George’s from 1511 to 1514, commissioned the great Italian Renaissance sculptor, Benedetto da Rovezzano, to construct a magnificent tomb for him. Work was well underway by the time of Wolsey’s fall from grace in 1529, and the black touchstone sarcophagus, black touchstone and white marble base, touchstone step, copper pillars and bronze statues, including eight angels, were swiftly appropriated by Henry VIII. Remarkably four of these angels survived the ravages of time and have recently been purchased for the Victoria and Albert Museum. This month’s ‘Image- of- the- month’ is a conjectural drawing, showing how Wolsey’s tomb might have looked had it been completed [SGC P.173]. 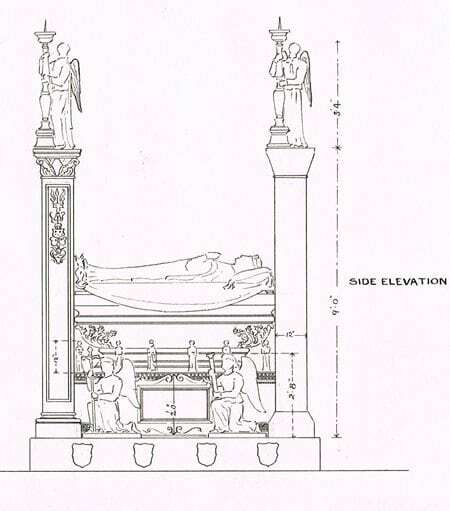 It was drawn by Mr Somers Clarke, Architect to St Paul’s Cathedral, for antiquarian Alfred Higgins, for inclusion in his article ‘On the work of Florentine sculptors in England in the early part of the sixteenth century with special reference to the tombs of Cardinal Wolsey and King Henry VIII’, published in 1894. The original drawing is one of a number of conjectural drawings by Somers Clarke held in the St George’s Chapel Archives [SGC P.169-180]. At the time the drawing was made, the angels were believed lost or destroyed and therefore Higgins had to base his suggestions for the reconstruction on the written descriptions in two inventories made for Henry VIII in 1530 shortly after he acquired the unfinished tomb. So where was Wolsey’s tomb at this point and what happened to it after it was impounded by Henry VIII? For many years scholars believed that, at the time of his death, Wolsey’s tomb was being constructed at Windsor in the Lady Chapel reputedly granted to him by Henry VIII for his burial. Alfred Higgins, having consulted with architectural historian, William St John Hope, was convinced of this and perpetuated the idea in his 1894 article. However, more recent research, by Professor Phillip Lindley, Tim Tatton-Brown and several others, has demonstrated that Benedetto da Rovezzano was working on the tomb in a workshop in Westminster, where it remained until the reign of Elizabeth I. There is certainly no reason to believe that Wolsey had been granted the Lady Chapel at Windsor for his tomb and there is no evidence that the Cardinal ever intended to be buried there. Despite an appeal from Wolsey on his final journey north for his effigy and any other part of the tomb that Henry VIII would spare him to be sent to York, Henry VIII refused the Cardinal’s request. Instead he lost no time in having the tomb redesigned as his own funerary monument. In the 1530s several payments were made to Benedetto da Rovezzano and subsequently to Giovanni de Maiano for work on the King’s tomb, specified in 1536 as being ‘at Westminster’. However, it remained unfinished at Henry VIII’s death in 1547 and although the King’s children made some attempt to fulfil their father’s wishes for his burial – Edward VI made further payments to the sculptors and left instructions for its completion in his will and Elizabeth I had the components of the tomb moved to Windsor in 1567 – all three failed to complete the tomb. It remained unassembled and largely neglected in the former Lady Chapel at Windsor (which thereafter became known as the Tomb-house or the Wolsey Chapel) until 1646 when the metalwork was sold by the Commonwealth to pay for garrisoning Windsor Castle. Some pieces of the tomb escaped destruction: two nine-foot high bronze candlesticks ended up in St Bavon’s Cathedral in Ghent, replicas of which now stand by the High Altar in St George’s. The black touchstone sarcophagus, which survived the Commonwealth, was transferred in about 1808 from Windsor to the crypt of St Paul’s Cathedral, London, to form part of Admiral Nelson’s funerary monument. However, the continuing existence of four of the bronze angels remained unknown until a pair of them came up for auction at Sotheby’s in 1994, catalogued simply as being ‘in Italian Renaissance style’. Some years later, in 2002, the Italian scholar Francesco Caglioti identified them as the work of Benedetto and made the connection with the Wolsey/Henry VIII tomb. In 2008 a companion pair of angels was located at Harrowden Hall, a country house in Northamptonshire now owned by the Wellingborough Golf Club, and it emerged that the angels sold at auction had been stolen from the golf club, where all four angels once flanked the two principal entrance gates of the estate. Reunited in the Victoria and Albert Museum prior their formal acquisition, these delightful candle-bearing angels give us a glimpse of the magnificence of the monument which might have perpetuated the memory of Cardinal Wolsey had he not failed to secure the end of Henry VIII’s marriage to Katherine of Aragon.